One of the priorities for this season at the King’s Palace at Malqata was to document, protect and interpret the one palace stairs that remains. 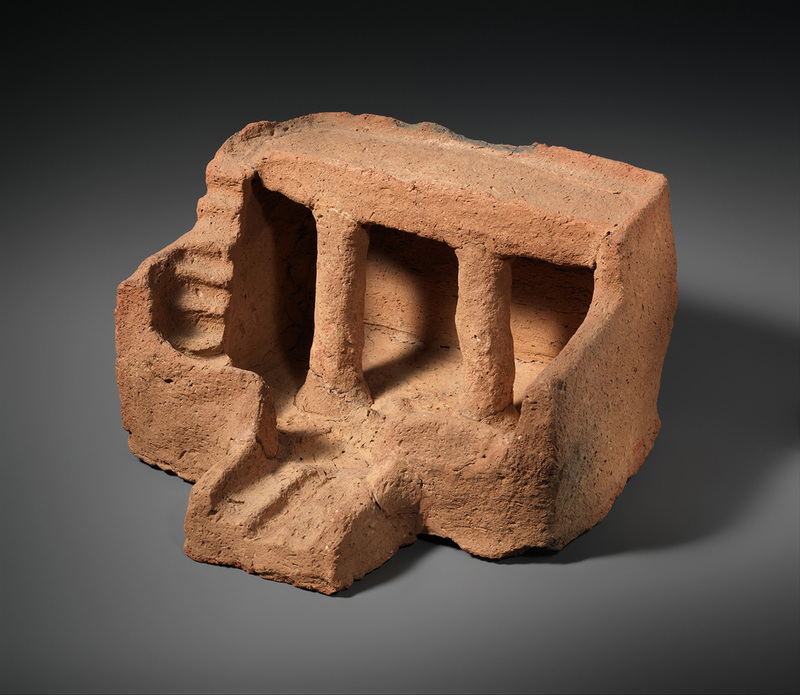 Four palace staircases had been identified when the Metropolitan Museum’s excavations concluded in 1911, two of which had been recorded previously by Robb DePeyster Tytus and Percy Newberry during their 1901-1903 excavations. The two staircases recorded by Tytus are highlighted in yellow. The one at the right is still partially preserved today. Detail of the palace plan published by Tytus in his preliminary report on the excavations in 1903. In this plan, south is at the top. Only one of the staircases documented by the Metropolitan Museum is still visible today and that one is in an important interpretive area just north of the main central courtyard. Undoubtedly there were other stairways and ramps to connect various parts of the palace but the preserved staircase is apparently the only one that clearly provided access to the second level of the main palace area. Model of a house with stairs leading to the roof. Gift of the Egyptian Research Account and the British School of Archaeology in Egypt, 1907 (07.231.11). The remains of this staircase consist of what I assume is the first step of four that were documented on the early site plans along with three parallel mud brick walls that formed the stair well. Both the steps and the adjacent mud brick walls were shown by Tytus with a flight of stairs on the west ascending to the south and the parallel flight of stairs on the east ascending to the north (see arrows on the plan above). The remaining mud brick walls and step (below) support this interpretation. Okay, so we have one step made of mud bricks which are 17 cm long by 35 cm wide by 10 cm high, and the remains of three parallel existing mud brick walls 5.7 meters long that define approximately the overall width of the stairs. That’s a start, but what about the height of the riser, or step, and what about the width of the tread? We can start by measuring the steps as recorded in the 1911 plan (above) and interpreting the width of the tread using the map’s graphic scale. This results in a tread of somewhere between 35 and 50 cm. This is quite a large range but the drawing that we are measuring was produced at a scale of 1 to 200 and, at that scale, the width of a line on the drawing could translate to several centimeters. There were three other avenues of research we pursued to more clearly define the stair details. The first was to look at other examples of stairs that are contemporary and are also part of Malqata. I reviewed the documentation of several stairs at the site of Kom el Samak located just south of the palace site. The relevant structure was a desert shrine excavated by Waseda University in 1974. There were several monumental stepped ramps, the gradient of which was too flat to fit in the allowable space at the palace. Another stairwat appeared more functional with treads of 43 cm and a riser of 11 cm. We also looked at stairs at the Amun Temple located approximately 300 meters north of the palace with approximately the same tread and riser as the Kom el Samak stairs. Another important consideration and one that would help establish the staircase details was to calculate the number of steps and the height of the steps that could reach a second level. Based on architectural modeling done at Amarna and other sites. I assumed that the height necessary to reach the second level would be somewhere between 3.5 and 4 meters which would include the thickness of a roof or ceiling system. If I used the step height of 11 cm and a tread width of 43 cm, the maximum height of each flight would be 1 meter and a total height of 2 meters, clearly not enough. To achieve a steeper stairway that could reach the appropriate height, we can increase the height of the step or decrease the width of the tread, or a combination of both. Increasing the height of a step to 15 cm, keeping the same tread width and assuming a 1 meter landing between flights of stairs we can gain approximately 3.6 meters or 12 feet. Talatat blocks from a temple of Amenhotep IV (Akhenaten), discovered at Karnak Temple and included as part of a large reconstructed wall on display in the Luxor Museum. Incorporating this important information into our design process would result in step height of 17 cm, as our remaining step consisted consists of bricks that are 17 cm wide. With an assumption that the second level would be approximately 3.6 to 4 meters higher than the first, 22 to 24 steps would be required. Assuming a landing of 1 meter, we divide the 4.7 meters by 11 or 12 steps for one flight and arrive at a tread width of 40-44 cm. Depending on the number of steps, the height reached by the stairs would be approximately 3.7 to 4.1 meters. The thickness of mortar and the variation in brick sizes could alter the actual number of steps to a minor degree. Of course we can never know the specific dimensions of the staircase, except the height of the steps, because all other information has been lost. However, this solution is logical as it incorporates the existing physical evidence, the documentation of the early Malqata excavations, and knowledge of normal construction practices of the period. After the walls were capped, we laid out two additional steps to indicate the possible configuration of the lower stairway. The preserved step has been covered with sand. Our next step was to construct a full size model of several stairs. We hope in the future to construct a partial staircase of four or five steps to show the general characteristics of a Malqata Palace stairway that is a considered response to the existing original conditions, to the earlier documentation at Malqata, to examples at similar sites and to traditional historic stair design.